A magnificent racer – Le Vier Cosmic Wind, G-ARUL, IWM, Duxford | Shortfinals - aviation and more! Whirlow Brook Hall – resurgence, at last! The sport of air racing has always been much more popular in the United States than in any other country. The early days in the 1920s were rather rough and ready, but soon a whole new ‘industry’ was born, the pinnacle of which were the National Air Races, held from 1920 to 1949, mostly at Cleveland, over a ten day period. Although there were cross-country races aplenty, the most exciting form of racing for the crowds was the close circuit race around a series of pylons. In the Nationals, this took the form of the Thompson Trophy Race, which attracted pilots who used high-powered ex-military aircraft. However, this sometimes leads to tragedy, and the deadly crash of a P-51 into a house, leaving three dead, caused the races to go on hiatus from 1950 to 1963. Not every pilot could afford to race such ‘heavy metal’, so in 1947 the National Aeronautics Administration Contest Committee and the Professional Race Pilots Association came up with a new, cheaper, yet still exciting formula – Formula 1 racing! The tiny racers this gave rise to were essentially the smallest airframe which could be designed around a Continental C85, a four-cylinder, air-cooled engine, of only 190 cubic inches displacement producing just 85 horsepower (at 2,575 rpm)! These engines were plentiful and cheap, so the new formula allowed many more pilots to participate in the sport, and they were encouraged by the sponsorship of the industrial giant Goodyear, who put up prize money for three annual Goodyear Trophy Races. Despite the limited horsepower, racers were so carefully designed that speeds of around 200 mph were soon being clocked. Races were now run around a much safer 6 – pylon course, after a fatal crash involving two flyers in May, 1949. N22C was raced for the first time at Cleveland (race number ‘5’) by Bob Downey, in his very first air race. The aircraft had full-span ailerons, and a rudder that stretched the full height of the fin, so it was very responsive to the controls. The tiny canopy was blended into the fuselage, and the cylinders of the C85 were closely cowled and cooled by ram air, forced past them from an opening at the front of the ‘helmet’ fairings. Unfortunately, Downey did not have much success with ‘Ballerina’. Neither did the rest of the Cosmic Wind racers, and they were generally ‘out of the money’ on the race circuit; however, that did not stop another Cosmic Wind being built, and much later, a U.K. homebuilt example (registered G-BAER), which is currently inactive. In the 1950s, because of the horrific earlier crash, interest waned in pylon racing and N22C was flown as a ‘sport plane’ around Southern California for a few years. In 1961, she was brought to the U.K. by the noted pilot/salesman Milton Blair, who demonstrated the aircraft in front of members of the famous Tiger Club at Redhill Aerodrome. N22C turned out to be a spectacular aerobatic aircraft, even though it was not fitted with an inverted fuel system. There were some comments amongst observers about ‘unstable yaw/roll coupling’, but Norman Jones bought it on the spot, and it was made available for use by Tiger Club members. A contemporary photograph shows her still wearing her US registration, ‘N22’, and the rating ‘Experimental’ under the cockpit, as well as the name ‘Ballerina’. G-ARUL, as she became, was capable of performing a lomcovak, an 8-point vertical roll (with only intermittent engine power) and an outside loop – with the engine OFF! Neil Williams, the doyen of British aerobatics, demonstrated and raced G-ARUL (which was given the race number ’75’ for a time); he won the 1962 Shoreham Class 1 Air Race at 180 mph, against a quality field. 1964 was to be a banner year for G-ARUL.The U.K.’s premier handicap air race was the King’s Cup, which had been revived after WW2; the pilot not only had to be skilled, but the race team had to wring every advantage out of their airframe, so they could ‘beat the handicappers’. There were two races at Coventry, and my friend Ron Paine, in the surviving Miles Hawk Speed Six, G-ADGP, had won the first, over the line at 190 mph. The Tiger Club’s Dennis Hartas, who was flying G-ARUL, was lying second overall when the second race began, and hoping to better his time in the first heat. The Speed Six managed 187.5 mph, and the Cosmic Wind, 185.0 mph. The handicappers had done their job well, and Ron’s advantage just wasn’t enough (although he did take the SBAC Cup for the fastest lap of the course), and Dennis Hartas won, not just the 1964 King’s Cup, but the overall 1964 Air Racing Championship! G-ARUL’s next outing was at the 1964 World Aerobatic Championships. The British Team had tried to use her in the 1962 World’s in Budapest, but there were no spares for her balky inverted fuel system. The 1964 British Team was a scratch one, including the brilliant Neil Williams, who nearly made it to the final phase despite having to switch G-ARUL’s fuel system on and off no less than 16 times during his display! It was obvious that a working inverted fuel system was just too much to hope for! (As an aside, the Team Secretary was the Royal Aero Club’s inimitable John Blake, who later I had the great privilege of working with, as a co-commentator). If 1964 had been excellent, 1966 was terrible. Piloted by Bill Innes, G-ARUL was down to take part in the Goodyear Air Challenge Trophy Race at Halfpenny Green Airfield, Wolverhampton, on the 29th August, 1966. Immediately after take-off Innes completely mis-judged his turn around the initial ‘scatter’ pylon, stalled, and ploughed straight through a hedge. The pilot was slightly hurt, but poor G-ARUL was declared an insurance right off, and classified by the CAA as ‘permanently withdrawn from use’. Some of the remains were bought by Paul Bannister, and, under the supervision of a Popular Flying Association Inspector, he began the long process of rebuilding the aircraft. About this time, a decision to fit a Continental O-200A engine of 100hp was made, in common with other Formula 1 aircraft, as the C-85 was no longer in production. The aircraft, with its ‘new’ construction number of PFA/1511, was re-registered on 21st June, 1973. Eventually, after several owners (and one charter! 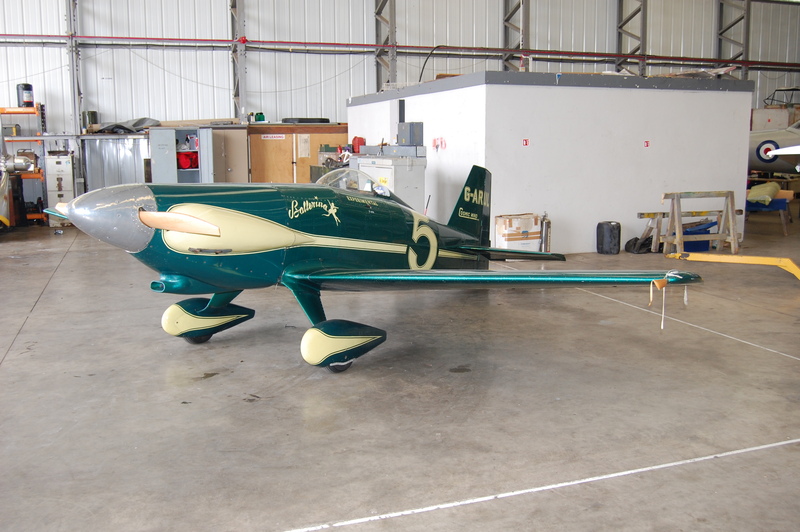 ), the little racer was acquired in 1984 by Peter Kynsey, and as ‘Ballerina II’ – currently, the only Cosmic Wind flying in the world – it is now displayed at airshows around the country. This is quite understandable, as Peter also flies the Fighter Collection’s aircraft, which you will find at the other end of this particular hangar at the Imperial War Museum, Duxford! Oh, and it is said that the manufacturer’s data plate, and the severely damaged wing and fuselage from the crashed aircraft are in store, and may yet form the core of a ‘new’ Cosmic Wind rebuild. The Le Vier Cosmic Wind – it may be small, but its a true thoroughbred!